Since the dawn of their civilisations, the great races of the Five Realms of Kholdrum, Shenaru, Ela’Vethera, Lorendale, and Zhoni have been engaged in complex relations with each other – allying and arguing, merging and dividing, loving and hating – as they each schemed and plotted to gain the upper hand over the others. Then the Darkness came. An army of unspeakable horrors of an ancient and forgotten race of infernal creatures awoke deep within the earth and marched across the lands. The Darkness ravished the Five Realms with death and destruction and nearly brought the continent to its knees. Faced with a desperate fight for their very survival, the great races put aside their differences and united into a warband of such magnitude and strength as had never been seen before. The world trembled. Though their great loss of life on the battlefield was nearly insurmountable, the warband’s sheer size eventually overpowered the armies of Darkness and largely drove them back beneath the earth. Sorcerers and shamans and magi of the great races invoked binding blood magic to start sealing the enemy away for an eternity. In the final days of battle to determine the fate of the lands, the hordes of Darkness and the great warband clash on four remaining battle fronts that are each located near a border landmark that separate the kingdoms of the Five Realms. The last four campaigns wage on. The end is near. 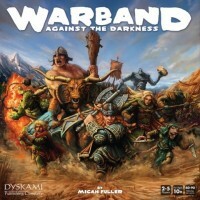 Add a Review for "Warband: Against the Darkness"